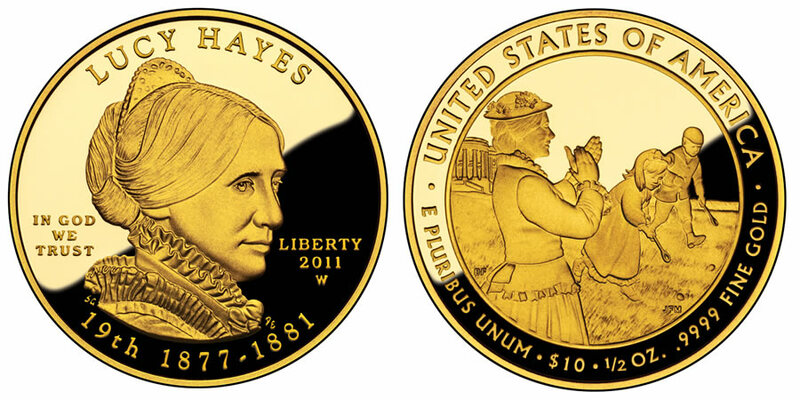 The Lucy Hayes First Spouse Gold Coin will be the third of four 2011-dated strikes in the series. It also marks the twentieth for the program overall which debuted in 2007. These strikes honor Lucy Hayes who was the wife of the 19th President of the United States Rutherford B. Hayes. They moved into the White House in 1877 after no inaugural ball. That is because when the Hayes left for Washington, his election to the presidency was still in contention. That tumultuous start did not adversely affect their time in the White House, however. Lucy was well skilled as a hostess owing to many years of practice as the wife of a renowned Civil War officer and politician. Even the fact that very little alcohol was served at the White House while they were there did not negatively impact the influence the couple had on the social circles of D.C.
Two versions of this coin are struck by the US Mint - a Lucy Hayes First Spouse Gold Proof Coin and a Lucy Hayes First Spouse Gold Uncirculated Coin. They contain the same designs but feature different finishes and are sold initially for different amounts. 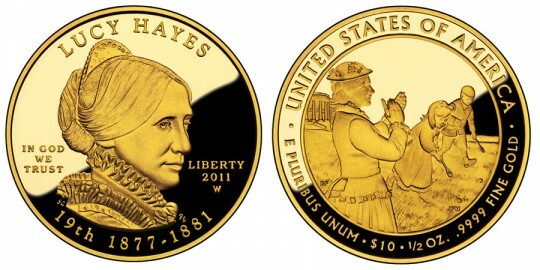 A portrait of Lucy Hayes will be shown on the obverse of the coin along with the inscriptions of "LUCY HAYES, " "IN GOD WE TRUST", "LIBERTY", "2011", "19th" and "1877-1881". The reverse will include the inscriptions of "UNITED STATES OF AMERICA", "E PLURIBUS UNUM", "$10", "1/2 OZ. ", and ".9999 PURE GOLD" along with a scene from the life of Lucy.